Instead of waging a war against the body’s defenses, the Functional Muscle Manipulation negotiates with them. Thus the body allows the therapist to go deeper with almost no discomfort. We teach you to breath with a deep, natural sigh of relief. That helps release more and will help you deal with the tensions of your everyday life. The FMM enhances your body-mind connection, giving you back control of those muscles even after you have kept them tight for decades. Your symptoms will most likely go away after a few sessions. After a series of them, though, the positive results will stay and can last for years. 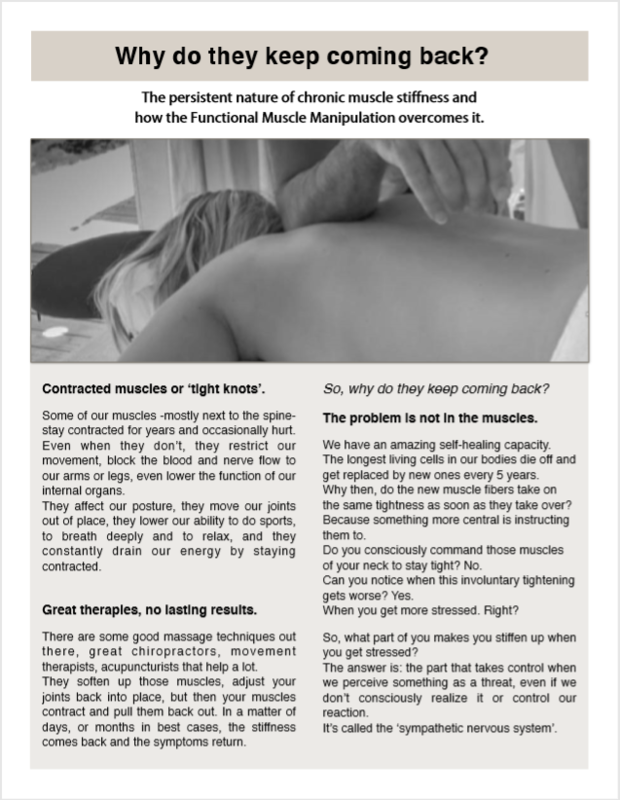 Why do pain and tightness come back after massages and chiropractic? Scroll down to book a session, or call us at (612) 405-3340! I originally found George randomly through a Groupon. After my first session I was beginning to wonder if our crossing paths wasn't so random. I have been dealing with some heavy emotions lately. George's calm and gentle demeanor was exactly what I needed. It was as if he could see through me and knew exactly what to say to make me feel better. Also, his use of Functional Muscle Manipulation and deep breathing techniques were successful in helping me let go of stress and pain. I highly recommend paying George a visit! I have been receiving therapeutic massages from George for a few months. He is skillful at "getting to the root of the problem" and has developed an effective method of having you engage by using a simple breathing technique which he will teach you (basically just taking a deep inhale and exhaling while he works out tight or tender spots.) You end up feeling relaxed AND get lasting results. I walked in to one session with a very sore shoulder and walked out nearly pain-free and movement has been improved ever since. He is a good and thoughtful listener too . Highly recommend! I have suffered from continuous acute back pains, especially the upper back and shoulders. I have tried numerous massage techniques which at best offered short term relief in the form of loosening up, which did not last for long. By coincidence I was told about Mr. George Rodafino’s Functional Muscle Manipulation. And l started. Having completed 8 sessions, I can honestly say that my acute back pains, no longer bother me. l feel that my upper body has been completely loosened, as if an enormous weight has been taken off my shoulders and neck. My stance has completely changed, my back has straightened. I feel light as if I have acquired a new neck and a new spine. The specific technique that is used for this therapy, is smooth harmonious movements and wherever needed they are more intense, their hands seem to go deeper without inflicting pain. instead the sensation is one of relaxation and comforting relief. Thank you George! George is a rare find. He puts so much of himself into the work he does. You can feel the difference. His technique is special and very healing. He does an amazing job of gradually working into the muscle. Therefore, unlike so many other massages it is painless and comfortable. I felt so revitalized after his therapy. I cannot wait for my next appointment. I have lived with back pain ever since I was involved in 2 car accidents (rollovers) in 1993. Since then, I have been in and out of physical therapy, chiropractic and massage, but nothing seemed to work. That is, until I met George. After my first session with George, I was pain free for 4 whole days. It was amazing. That is the first time in over 20 years that I felt that good. After each consecutive session, I feel better for longer periods of time. Another amazing thing has happened. I get taller. At first I thought it was a fluke, but it happens after every session with George. It is definitely not a coincidence. When I get in my car to leave, I have to adjust my rearview mirror upwards, because it is too low for me to see. One hour with George stretches my back out enough that it is noticeable, when I get in my car. Who would've known. Thank you George! Amazing work! George does an excellent job of correcting muscle issues that have been place for years. Many of the aches and pains that he has resolved for me were ones that I thought I was going to have to live with for the rest of my life. George is truly amazing! Like so many others, I have been suffering with chronic back, neck and leg pain, and I have tried various massage therapists and chiropractors. They provided some relief, but George is the one who provided significant relief! After only one session with him I woke up the next morning without back or leg pain, and with renewed vitality! He found tightness in places I didn't even know existed. And I appreciated how he educated me about his technique. I am so happy I found George, and I will go back for treatments as much as possible! Really good technique!!! It works so deep in muscles that it enhances permanent treatment from chronic pains. I have tried so many treatments, they worked only temporarily! This is the best!!! Thank you George!!! !